After its 3rd full year of production, the patented LiftSUP handle has been installed in over 40,000 boards and continues to improve the paddling experience based largely on customer feedback. New for 2014 is a soft rubber coated handle that provides a more comfortable and secure grip. The rubber also helps keep the handle in place and prevents any plastic rattling noise from occurring. In addition to its improved design and comfort, the handle has boosted its tensile strength over 850 lbs and shear strength over the original 450 lbs. 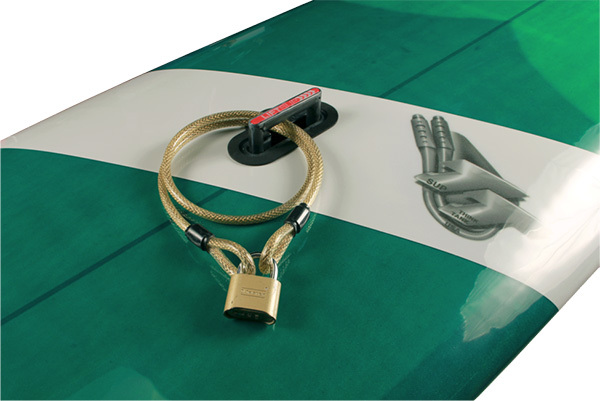 The increase in the tensile strength and improved handle design makes LiftSUP a great way to carry your board, and also provides a solid attachment point for a lock and cable to help theft. 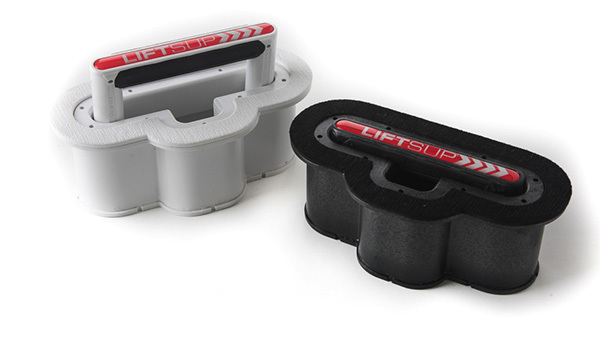 For those of you not familiar with the LiftSUP handle system, It is a retractable handle that allows the user a significantly better way to carry, maneuver, and manage their board out of the water. When not in use the handle sits flush with the deck of a board and has a small access hole to allow raising the handle for ease of grabbing and controlling on your way in or out of the water. One of the often over looked advantages of a flush, retractable handle as opposed to a hand hole is it eliminates the potential liability of jamming your foot into the hand hole and even worse breaking toes. The handle aids the user in finding the perfect center of balance when transporting their SUP. Each handle has a gel dome label that sits on top of the handle creating an ergonomically correct feel in your hand and gives a bit of traction on the deck of the board in the event that you step on the handle during use. One of the best things about the LIftSUP handle is price. [highlight]At $8.00 a handle it is the best investment you can make in a board[/highlight]. It increases the value of a board and makes the paddling experience even more enjoyable. Made in the USA , the LiftSUP handle is produced by the crew at SUP Think Tank in Encinitas California. They are a highly devoted team of seasoned paddlers and waterman who are always looking for new and exciting ways to make the paddling experience better.